This morning the D parents and two of the D offspring left for a week long speaking tour on the other side of the country. To illustrate how far it is from one side of Russia to the other: it's seven time zones from NY to St. P; it's also seven times zones from St.P to Vladivostok. So now Nanny 2 and I are now officially in charge of laundry, cooking, clean up, and oh yes, the children, with the much appreciated sometime help of Miss P, Mrs. P, and Friend H.
On the way to church last Sunday: Me, Friend H, and Miss T.
We two Nannies, one an enthusiastic, outgoing seventeen year old from California and the other a fairly quiet twenty-four year old spinster from Nebraska, must achieve a balance of authority over six lively children between the ages of almost thirteen and one. It's voting day back home. I've been so disconnected from the political area this past year it feels a little unreal. Even though I did change my voting location after we moved, I didn't have time before my trip to find out about early voting or voting overseas, so I ended up not voting. After being so involved in the election cycles the last six years it's rather nice to take a break. 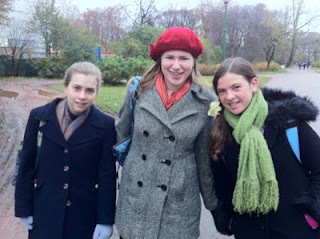 Miss P is on school break and Mrs. P is back from her father's funeral, so today we all went to the Catherine Palace and Gardens in Pushkin, which is now a wealthy suburb of St.P. We walked the five blocks to the metro station and sped away: about four stops on the orange metro line and five on the blue- and then took a taxi bus to the Palace. All in all it took about fifty minutes one-way. We all enjoy taking the metro except for getting through the entryway turnstiles- they sometimes get stuck and it's a pain. I dread the turnstiles. Everyone enjoys the super long escalator and trying to stand on the super fast train. Photos aren't technically allowed in the metro, because it's also a fallout shelter. Inside all the train doors there's a sign: "Do not lean against the door!" and also in Russian: "Не прислоняться!" We were joking about how "Do not lean against the door" must translate into Russian: "Do notleanagainstthedoor." Mrs. P said the literal translation for the Russian is "do not lean your elephant against the door." We thought that was pretty funny. It was grey again. I think it's just always going to be grey, which is fine with me, but it's hard to take good photos. We didn't go into the Palace. The line was a mile long and I'm sure it cost. We walked around the gardens, which were amazing even in the off-season. It must be so beautiful in the summer, though I hear the crowds of people are constant. I prefer empty gardens, personally. There are so many people in St.P. I wouldn't mind exploring a house this size. Walking all over is exhausting. It reminds me of my time in Scotland. Other than during the political season we don't walk this much back home. Today we walked and walked and walked all day. buying those $8 boots from Goodwill the week before I left was the best trip investment yet. Some servants stairs outside the bathroom. Or, as it's called on the English signs here, the WC- water closet. You had to pay 20 Rubles to use the bathroom, and one of my coins was rejected as out-of-date, being from 1993. Finally, a door my size! There were all sorts of small buildings scattered throughout the gardens. One can imagine all sorts of dramatic and romantic meetings and duels happening, back in the day. It made me particularly think of Christa back home(you would have loved it, Christa!). An example of the buildings on the Palace grounds: There was a whole small village made up of Chinese architecture on the grounds. It wasn't open to the public, but you could see it from across the stream. Yesterday this blog passed the 100 mark with 112 official pageviews. I think that's pretty exciting, though I'm still unsure if it's all due my parents checking frequently. Another outbuilding, taken on the way out. This is about where we lost Mr. A as he stopped to tie his shoe in the crowd of tourists. We got a few blocks away before someone noticed he was missing. Thankfully Mr. A, being eleven years of age, has good presence of mind and was thus quickly found. We walked around the nearby outdoor market (which was selling mostly clothing and produce) and then headed on home. Remember our latest drunken drama story? Apparently those drunk men from the other night were from Dagestan, probably illegal immigrants here working on a nearby construction site. We've seen one of them at the store twice since then.